University of Pittsburgh Press, 9780822963813, 104pp. 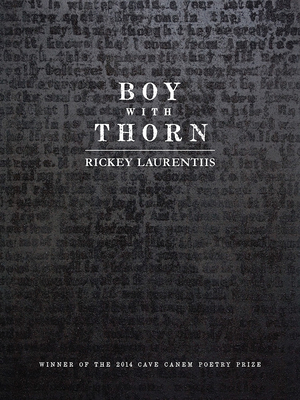 Rickey Laurentiis, winner of a 2018 Whiting Award, is a Cave Canem Graduate Fellow, is the recipient of a Ruth Lilly Fellowship from the Poetry Foundation, as well as fellowships from the Civitella Ranieri Foundation in Italy, the National Endowment for the Arts, and Washington University in St. Louis. His poems appear or are forthcoming in Boston Review, Fence, Kenyon Review, New England Review, New Republic, Poetry, and elsewhere. Born in New Orleans, Louisiana, he currently lives in Brooklyn, New York. “Whether in praise songs, appraisals, or meditations, the poems of Boy with Thorn embody an ardent grace. Their accomplished structures house a fearless sensitivity. Laurentiis fills history with his ‘crucial blood,’ his ‘stubbornness,’ his ‘American tongue’; history, in return, fills him with crucial muses (from Auden to Hayden), stubborn ghosts (such as Emmett Till), and manifold expressions of culture (southern, sexual, spiritual). The result is an extraordinary and ultimately irreducible debut."